PYP is an initiative meant to educate the general public about the harm fats, oils, grease, “flushable” wipes and expired prescription drugs can do to household plumbing, the public sewer and the environment. Established in 1957, the Metropolitan Washington Council of Governments (MWCOG) is a nonprofit organization made up of elected leaders from Washington DC, Maryland, Virginia and the United States Congress that manages the responsible growth of the Washington DC region. MWCOG came to Sabra for help with their Protect Your Pipes (PYP) initiative. This initiative is meant to educate the general public about the harm fats, oils, grease, “flushable” wipes and expired prescription drugs can do to household plumbing, the public sewer and the environment. 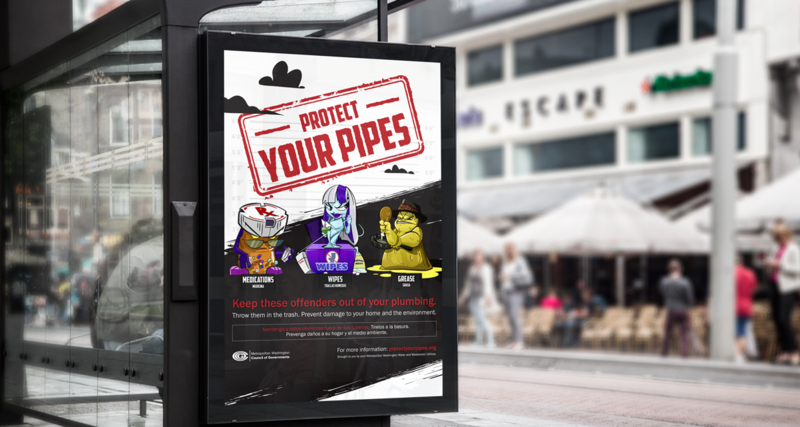 The Sabra team created an entire public outreach campaign that included the overall branding for the Protect Your Pipes message. 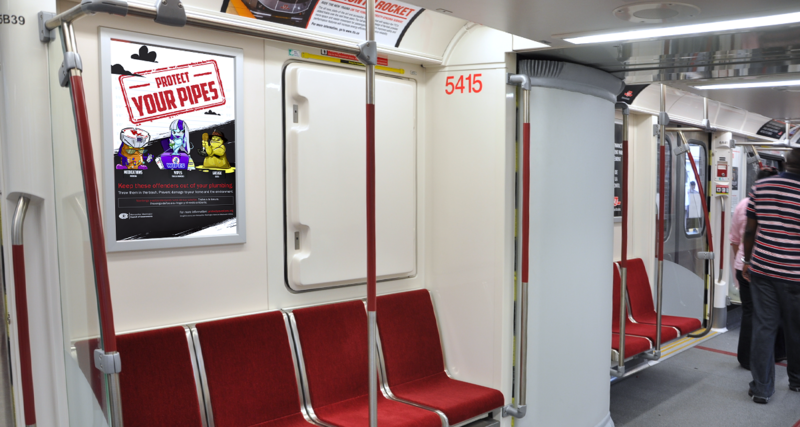 The campaign focused on three illustrated characters and an animated video, bus ads, train ads, booth signage, a coloring book and stickers that all featured the three “usual suspect” characters. We pitched the idea of making the troublesome elements villainous characters, or “usual suspects” the public could more easily relate to and received a positive response from the folks at MWCOG. This gave us a strong direction for the brand that was carried through each element we designed for the campaign. The Brand Guidelines is a document that we provide to all clients who use Sabra branding services. It’s basically a “user manual” for the brand. It tells the client what colors and fonts we used and gives them a link to download all the files for the various elements we’ve created for them. The guide tells organizations the best way to use their brand, as well as what not to do with it. The reason we do this is for brand consistency if the client opts to take over control of the brand or even use a different branding service. The Sabra team thought about how best to present a yucky subject that people generally don’t like to think of or talk about. What goes down people’s toilets (and what shouldn’t go down there) isn’t something a lot of people like to address or hear about. We wanted to make this a subject that people could think about in a pleasing, entertaining way that would also be accessible to kids, since this kind of education has to start early. That’s when the light bulbs went off and we decided on illustrated characters that we could also showcase in an animated video. 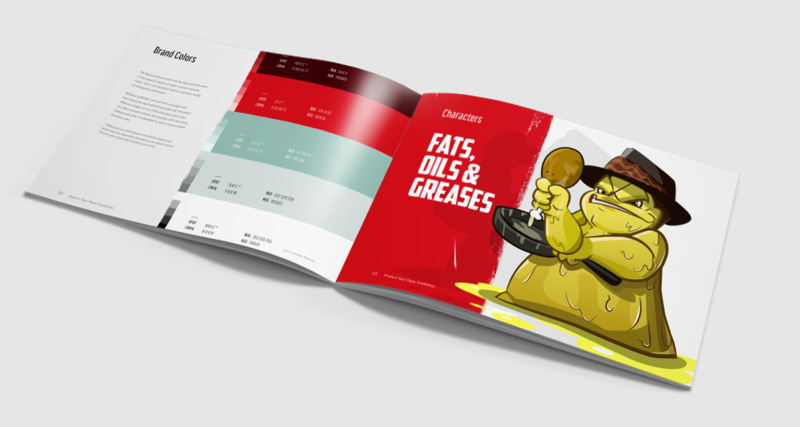 We combined fats, oil and grease into FOG, who is a puddle of grease come to life. 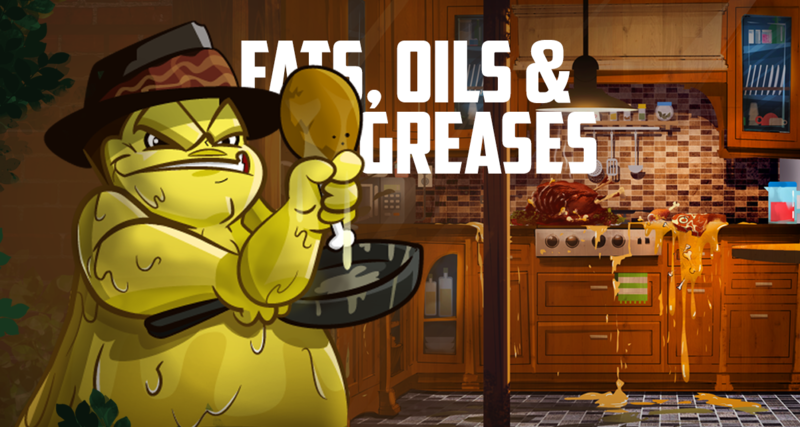 He is holding his tools of the trade — a greasy frying pan and a chicken leg — to display some of the sources of grease that can cause havoc in plumbing. The finishing touch on FOG was his bacon wrapped fedora. 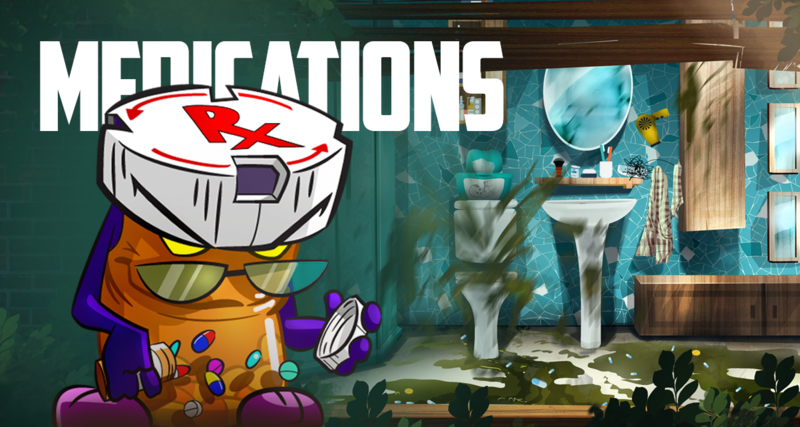 Although the dubiously named “flushable” wipes are a main culprit for blocking sewers, we also wanted to include some other less troublesome — but still terrible — objects that are bad for pipes, so we drew the Wipes character holding some floss and surrounded her with cotton balls and cotton swabs. The flowing nature of wipes lent itself naturally to a female femme-fatale villain’s long, flowing hair. The Old Medications character is an evil bottle of expired prescription medications, hence the yellow eyes, the angry eyebrows and the sinister smile. It is often their expired medication that gets flushed down the toilet — which causes many problems in city sewards and water reservoirs. We worked with MWCOG to develop a 30-second animated spot for the PYP campaign from script to post-production. We auditioned several voiceover actors to find the perfect narrator. 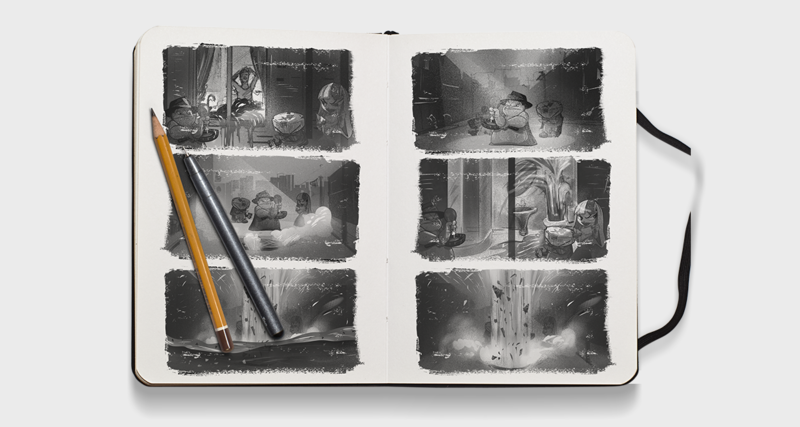 Our incredible illustrators created every scene, background, prop, and special effect. These ads were featured on the sides of buses and inside local commuter trains in northern Virginia, Washington, DC, and Maryland. For use in the PYP initiatives information booth that was set up at various public events, this signage was similar to the transit ads. It needed to convey information using the characters in a way that would make people want to stop and find out more about the campaign. One of the more fun elements of the campaign, we created a small coloring book featuring the three villainous characters. We kept it simple since this is aimed at drawing children into the campaign. In addition to the coloring portion, we also included a simple word search for kids to help them identify things that shouldn’t be put down the toilet or drain. Mainly, this was designed as a teaching tool for parents so they can educate their kids about the campaign. The stickers are given out at events to help spread the word about the campaign. 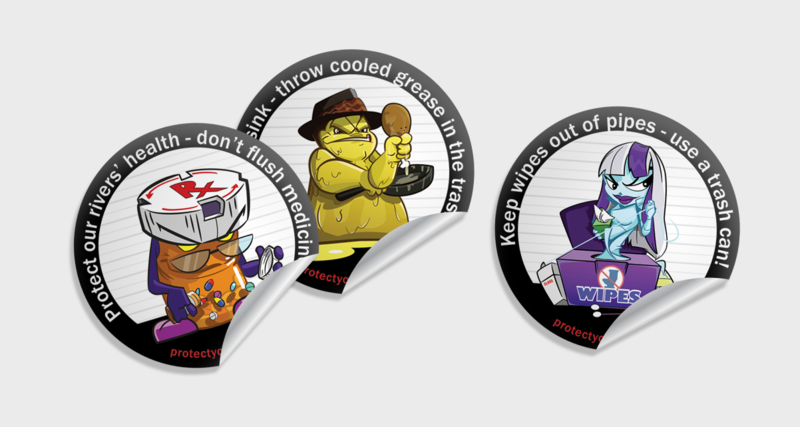 FOG (fats, oils and greses) stickers were distributed to DC area grocery stores during Thanksgiving, to be attached to turkeys as a reminder to everyone not to put grease down their drains. Similarly, the Old Medications sticker is attached to old prescription bottles. The PYP campaign was a resounding success. It has been extended and expanded in ways we were not expecting, but are quite pleased to see. The best indication that we have for the success of this campaign is that it is now a national campaign rather than just a regional campaign. Other major cities across the USA that have similar problems with non-flushable items clogging sewer systems and old medication wreaking havoc on local ecosystems are now going to start using the ads and other visual elements to start educating people about the dangers of grease, wipes and medication when it comes to the sewer system and local ecosystems. The bus and train ads were only meant to run for eight weeks, but were so successful that MWCOG decided to keep the campaign running for several more weeks. The ads reached an estimated 50 million impressions, meaning they were seen that many times by people. That’s a lot of people seeing the ads and learning about how to protect their pipes. As with all our projects, the true success for us is measured in the positive impact we make in the world around us. And by that measurement, this campaign has been highly successful. Teaching people, especially young people, about the dangers to infrastructure and the environment from these particular items makes this campaign one we’re especially proud of. We may just be the superhero’s sidekick in this tale, but we are quite proud to let the public be the real heroes in this fight against sewer crime. world in your own way?